I do not belong to that subgroup of women who have immaculate houses. In fact, those types of houses (and women) scare me. If I walk into a house and it feels like a storefront window, or a hotel suite at the Sheraton, I begin to feel a little bit uneasy. Not only that — I automatically begin to feel inferior. I actually begin to feel physically uncomfortable. I have that flight or fight response. In my case, I feel like I just need to escape. 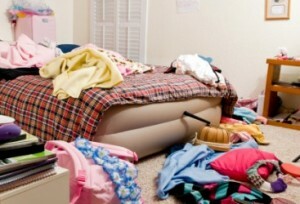 Now don’t get me wrong, I abhor extremely messy houses too. Sitting in chaos or a dirty house also strikes me bizarre. In those situations, I also experience the stress response; I just want to get out. I must admit I often wonder why God created housework. I know that in most cases, we create housework by the mess we make and the stuff we buy. But there really is housework that is made by for us by some invisible force. Consider hanging dust, that kind that creates spider-like webs on legs of furniture and walls. How does it get there? Why does it get there? I often think about stuff like that. After staring at it and meditating for awhile, I do eventually face the fact I do have to clean it up. While seemingly unimportant, mundane and mind -numbing, housework needs to be thought about. Just the sheer amount of time we spend doing it demands our attention. Making beds, washing dishes, drying dishes, putting them away, washing floors, dusting, laundry, the folding, the putting away of clothing, the weekly sock hunt, toilets, sinks, stairs and walls, vacuuming, sweeping, window washing, never mind the cooking, shopping…. It all takes so much time and it can be exhausting. I will never forget the year I had my first child, transitioning from a high-profile career that gave me tons of recognition, to being at home, picking Cheerios up off the floor. I remember being shocked at all of the hidden work of a stay-at-home mother– All of the work that gets no recognition at all. My thoughts turned to Mary, and her son Jesus and their hidden years. Surely there must have been some meaning in it all? God knows that all of this work takes time, which on a certain level means that He’s willed it for us. There is no escaping it. Housework is here to stay. I am determined not to tackle it all alone! I remember once being taken aback by a couple of teenage boys who were visiting a friend’s cottage. While the entire family got up to pitch in, do chores, pack and clean, these two boys admitted, “Clean, chores, work? I don’t know how to clean. We have housekeepers, and other hired help. They all do that.” These boys were serious. Both came from affluent families that didn’t make their children do ‘that’ type of work. As a Catholic, I try to stare down housework with Catholic spiritual tools. I often turn to St. Therese and ask her to help me do little things with love. When I don’t feel like doing housework, I do it with a specific intention, offering up my work to God as a sacrifice. I lift my heart to Mary and ask her to give me the patience to do this type of work. Martha, Martha, you are anxious and worried about many things. There is need of only one thing. Mary has chosen the better part, and it will not be taken from her. and pans, helping you in all things’. As a stay-at-home father with three small children I completely identify with this article. Excuse me now, gotta take the bread I’ve been baking out of the overn. or occupation in some important work. As a stay-at-home mom, I consider my time spent on housework to be a service to my family and a logical part of my vocation, allowing them to focus on their vocational tasks of earning (husband) and learning (kids). It’s a trade off I make with joy. Dare I point out that Jesus loved Saint Martha too? We tried unsuccessfully to teach one of our sons to tidy his room. He was unbelievably messy. Then he married and my wife is not allowed into his house without taking off her shoes.